WASHINGTON – American Action Network’s Middle-Class Growth Initiative (MCGI) today launched a $2 million ad campaign as momentum for meaningful, pro-growth tax reform continues. The blitz comes as Congress prepares to vote on the Senate’s budget resolution, and targets 32 congressional districts nationwide. 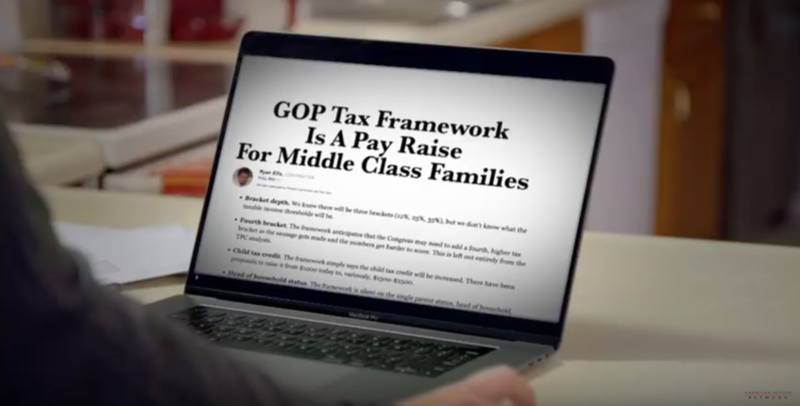 The unique, district-specific ads feature Lindsay Pratt, a working mother from Wisconsin, highlighting the importance of middle-class tax cuts for families like hers. View the list of targeted districts here. American Action Network launched the Middle-Class Growth Initiative in August to promote the passage of pro-growth tax reform. The MCGI’s efforts, now totaling over $14 million in spending, include TV, radio and digital ads, direct mail, and mobile billboards targeting over 40 congressional districts across the country.